In November, Lexus will introduce the next exclusive designed model in the Inspiration Series. PLANO, Texas, Oct. 31, 2018 /PRNewswire/ -- The LX is more than just a luxury SUV. It's an inspiration for those who desire a higher-level driving experience. Already equipped for the road with high quality materials and exhilarating performance, this luxury SUV takes all the worry out of decision-making. In November, Lexus will introduce the next exclusive designed model in the Inspiration Series. The LX features a stealth Black Onyx exterior that rides high on 21-inch black alloy wheels and center caps. This new beauty also leads with a black front grille and dark chrome surround. The LX is also enhanced with black trim for the headlamps, foglights and windows along with smoked headlamp lenses. The rear of this flagship SUV continues the black theme with black chrome accents for the taillamps, license plate and back door. An exclusive Moonlight White Semi-Aniline Leather Trim with a black headliner complement the black exterior. To help complete the thoughtfully crafted luxury SUV, the carpet, cargo mats and key gloves all provide unique finish to the interior. All LX Inspiration Series come with heated and ventilated front and second-row outboard seats. The Climate Concierge feature automatically monitors the temperature of the four separate climate zones and adjusts not only the fans, but also the temperature of the seats and steering wheel. In addition, the "LX" projector door lamps round out this Luxury package. Every LX Inspiration Series also includes the following features: Rear Seat Entertainment System, 19-speaker, 450-watt Mark Levinson®1 Reference Surround Sound audio system and Color Head-Up Display (HUD). In addition, a Cool box, wireless charger and heated wood & leather-trimmed steering wheel complete the package. Available just in time for the winter holidays, only 500 luxury owners will be able to drive the exclusive LX Inspiration Series home. It will go on sale with a starting Manufacturer's Suggested Retail Price (MSRP) of $100,420. 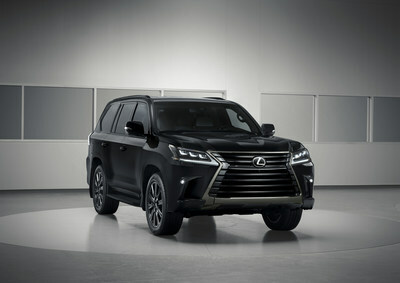 Like all LX 570s, the LX Inspiration Series is powered by a 5.7-liter V8 engine with 383 horsepower and 90-percent of its 403 lb.-ft. of torque available at 2,200 rpm. Equipped with an 8-speed automatic transmission, the LX is capable of towing up to 7,000-lbs. The LX's sturdy body-on-frame structure is combined with a multi-terrain system to enhance the driver's control over challenging, varied landscapes. The system adapts to five different types of terrain — Rock, Rock and Dirt, Mogul, Loose Rock and Mud and Sand. Low-range gearing provides slow-speed crawling capability for handling steep off-road hills and uneven terrain. Driver's also get additional support from the LX's innovative Crawl Control system that is fortified with Turn Assist, Hill-Start Assist Control and Variable Gear Ratio Steering. Drivers are armed with the standard Blind Spot Monitor (BSM) with Rear Cross-Traffic Alert (RCTA). To help keep the driver's eyes on the road, the LX puts more information directly in line of sight with a Color Head-Up Display (HUD) on the windshield. This system shows the vehicle speed, Dynamic Radar Cruise Control information icons and Intuitive Park Assist. The LX Inspiration gets the standard Lexus Safety System+ that includes Pre-Collision System (PCS) with Pedestrian Detection, Lane Departure Alert (LDA), Intelligent High-Beam headlamps and All-Speed Dynamic Radar Cruise Control. A 12.3-inch navigation display with Remote Touch Interface (RTI) heads a list of multimedia and connectivity features that keep the LX on the cutting edge of user tech. The multimedia display screen can be split into three sections to show different functions, such as navigation, audio and climate control information. "It's always our goal to exceed our guests' expectations," said David Christ, group vice president and general manager, Lexus division. "We expect the LX Inspiration Series to continue that tradition with its customized features. We look forward to this new addition to the lineup and are excited for our guests to Experience Amazing." 1 Mark Levinson is a registered trademark of Harman International Industries, Inc.